So, you just bought a shiny, new, and maybe expensive, lens for your camera, and being the savvy consumer, you did your homework. 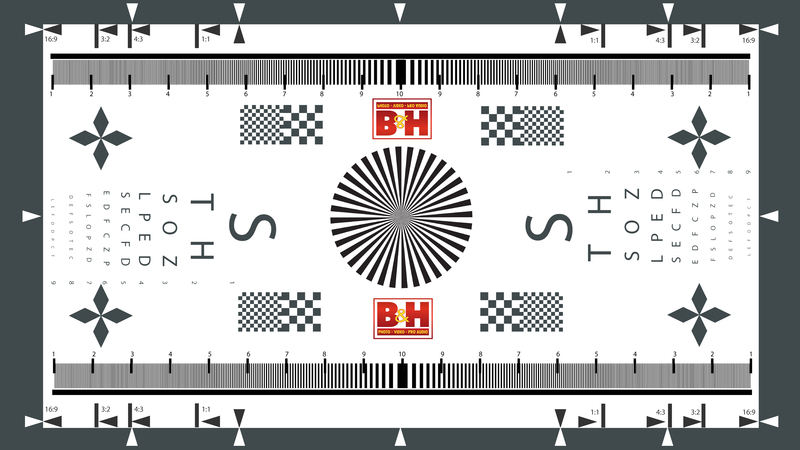 You pored over customer reviews on the B&H Photo website, read online reviews splattered all over the Internet, grabbed a copy of every photo magazine that reviewed the lens, bookmarked dozens of websites, and now have the lens’s MTF curve charts burned into your retinas. Now, your lens is here and it is time to go out shooting. Honestly, not a problem. Your lens should be as good as it can be and, as photographers, we want to take photos. So, stop reading and go out and make some photographs! Still here? OK, let me tell you why you might want to test that lens yourself. The main reason is that even with today's precision computer-controlled manufacturing techniques, there are variations in each and every lens that rolls off an assembly line. This means that some examples will be better than others. Some lenses will be outstanding and others will make you wonder if all of those glowing reviews you read online were completely bogus. I once purchased a new 40mm lens that was advertised and reviewed to be, based on all reviews, incredibly sharp. The Internet is full of tests that show this is a superb lens. I spent some good money on this lens and hurried home to try it out. However, me being me, I took the new lens out for a shoot with my tried-and-true 50mm f/1.8 lens in the bag. I took the same photos with the two lenses, albeit at the slightly different focal lengths, and hurried home. After analyzing the images, I was left to speculate that, either the reviews are full of lies about this 40mm lens, that I got a bad example of this lens, that my 50mm f/1.8 is the most awesome lens ever made, or a combination of those possibilities. "I like to test my lenses to determine where in their aperture range and focal range (if a zoom) they are performing at their best." Had I not had a lens to which I could compare it, I might have been happy with the performance of the 40mm and not known the difference. But, because I did a quick test of my new lens, comparing it to a lens that I was familiar with, I was able to determine that it should be returned to the store and my money saved for something else. Knowing that no two lenses are the same, as far as performance, why else would we want to test a lens? For most of my photography, I want to maximize the sharpness of an image. In order to do that, I like to test my lenses to determine where in their aperture range and focal range (if a zoom) they are performing at their best. A lens’s sharpness and degree of vignetting will change based on the aperture selected, as well as its focal length, if it is a zoom. getting the testing out of the way so that I can go out and make photos. There are a lot of people out there who go absolutely nuts with lens testing. So, if, after you read this, you find yourself building a dust-free clean room in your home, walking around in a lab coat, and trying to figure out ways to shoot laser beams through your lenses onto a computerized target sensor for dispersion analysis, you may want to consider a new career with some of the more well known lens-testing websites and magazines. Also, as anyone with an Internet search engine can attest, there are many different opinions and techniques regarding how to test lenses. I generally test my lenses for sharpness. However, you can test for vignetting, symmetry, distortion, focus, and other factors in the comfort of your own home without fancy gear. So, feel free to share your ideas and methods at the end of this article, but please know that what I am sharing here is, simply, my personal technique and I am not suggesting it is the only way, or best way, to test a lens. Before we get into the gear needed, you should, if you have it, turn on the part of your brain that may have been lying dormant since grade school science classes. The testing of your lens is an experiment and you need to have a basic scientific mindset to make sure you do not have to go back and repeat the tests over and over again. What do I mean? You need a plan in place before you get started. Have paper and a pencil handy to take notes. Photography can be done “from the hip,” but good lens testing needs a methodical approach. Don’t worry, we aren’t doing crazy stuff here, just know that a bit of pre-organization and a good plan will make it all go smoother. Also note that there will not be a “control” for this experiment. If we all owned an optically perfect lens with which to test all others against, we would not have to test our lenses, right? So, your lenses, with their inherent flaws, will either be tested against themselves or other flawed lenses. The most crucial piece of gear you will need for a lens test is a tripod. If you do not have a tripod, you will not be able to perform an accurate lens test. Period. No one that I know can handhold a camera completely steadily. Going back to the scientific process mentioned above, we need to eliminate as many variables as possible when performing our tests. Movement is something we need to eliminate in both our camera and target. I highly recommend using a remote shutter release (cable, electronic, or wireless), and if using an SLR camera, the mirror lock-up mode to reduce vibrations. I have been told that a famous photographer once said, "I do not photograph test targets.” Well, I do. But, I am not famous. Yet. There are lots of things you can photograph to get a solid lens test. You can do it indoors or outdoors. You can create your own target, buy a target, or print one from the Internet. You can use what is around you. The possibilities are endless, as are the opinions about what works best. Full-resolution image available by clicking on the illustration above. Test targets are versatile and can be used for a variety of tests. Some, like the ISO 12233 chart and USAF 1951 Resolution Test Chart, will come up on most web searches. Personally, I located the highest-resolution chart I could download and then I had it printed on photo paper at a big box store at 20 x 30" and dry-mounted on foam core. I was tempted to mat and frame it for permanent display, but all of the wall space in my home was already taken up by photos. Is a printed test target a perfect target? No. If you want to get crazy, you can spend a lot of money on laser-etched glass targets that are used for calibrating things that are way more precise than your camera and lenses. A printed test target will be your least expensive option. Some folks will make a homemade diorama with different objects (wine bottles, color charts, tourist trinkets) to photograph in one scene. This is fun and works well for the test, but the problem is, unless you have very understanding roommates or the only key to your photo cave, you will have to put all the objects away when you are finished and you might not be able to recreate it perfectly in the future. The two-dimensional test target gets put away into the closet when I am finished. I kind of cringe when I go to a camera/lens review test website and see photographs of trees as a test target. Why? Well, trees move when the wind blows. Remember what I said about eliminating variables? When I do a lens test outside, I look toward manmade structures (usually stuff that humans make has a ton of right angles and sharp edges) and I try to put lettering of some sort (street sign, license plates, storefront signage) in the center and corners of the image. Remember, you are testing your lens, not creating the greatest photograph on the planet, so don't worry about composition and all the other things that you might usually consider before taking a photo. Also, you want the things you are going to study in the image to be as close to equidistant from you as possible. When shooting a target on a wall, level your camera and aim for a vertical wall. When outside, try to find a wall or scene in the distance that will have the center and edges of your frame about the same distance away. I have found that a well-populated bookshelf is a great tool for lens testing. Remember what book you are targeting in the center of the frame and use the writing on the spines of the surrounding books to check your sharpness. Also, the shelves, if straight, can let you evaluate lens distortion. 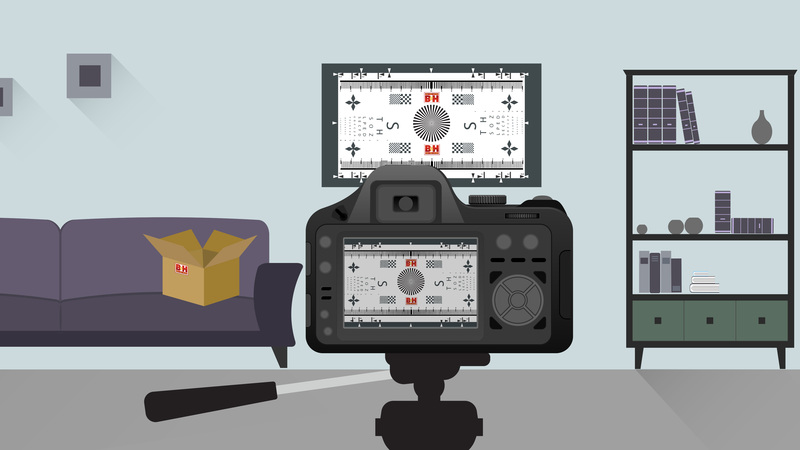 Speaking of distortion, the “brick wall” is often mentioned in lens-testing circles. Not the worst idea, but I would hope to find one with some signage on it to give me some sharp edges and lines to look at in the images. If you can do it, I recommend the test target for normal (around 50mm) and telephoto lenses (greater than 50mm) and a wall or bookshelf for wide-angle lenses. Many of us have a camera bag full of zoom lenses and prime lenses. If you have only one prime (fixed focal length lens) to test for sharpness, your mission is simple. If you have a quiver full of lenses and many of them are zooms, you will thank me later for that suggestion to get paper and pencil ready. For a normal or telephoto prime lens, I simply set up the tripod and camera at the distance where the target fills the frame, and then I take photographs as I run through the aperture settings. When out doing non-lens-test photography, I adjust my aperture in full stops to simplify the exposure math for me. I do the same for lens testing. If you adjust your aperture in half stops or third stops, you will get two or three times the number of test images to sift through and that might be enough to make this process less fun. For zoom lenses, I roll through each aperture setting (full stops again) at the focal lengths marked on the barrel, which usually correspond to popular prime lens focal lengths (85mm, 105mm, 135mm, etc). Of course, I will always test the zoom at the widest angle and the greatest, as well, even if they do not correspond to popular fixed focal lengths. This is where a little planning helps. Say you are evaluating an 85mm f/1.8 prime lens, an 85mm f/1.4 prime lens, and a 70-200mm f/2.8 zoom lens. You can mount each 85mm lens and roll through the apertures, but, before you move your tripod you might want to grab the 70-200mm lens, set it to 85mm, and test at that focal length. Take notes. The image metadata will help remind you what you were doing later, but it is good to have a check-off sheet tracking your progress, so you do not waste time by repeating tests. Also, if you are testing older, manual focus, pre-electronics lenses, your notes will help you when and if the metadata does not recognize the lens or aperture setting. When I test my manual focus lenses, I try to set up the test so that the targets fill the frame, while allowing me to focus the lens at infinity in an attempt to eliminate focus errors. Well, you just took several dozen pictures of a test target, bookshelf, wall, or city scene. Now you get to spend some time in front of the computer analyzing the data. 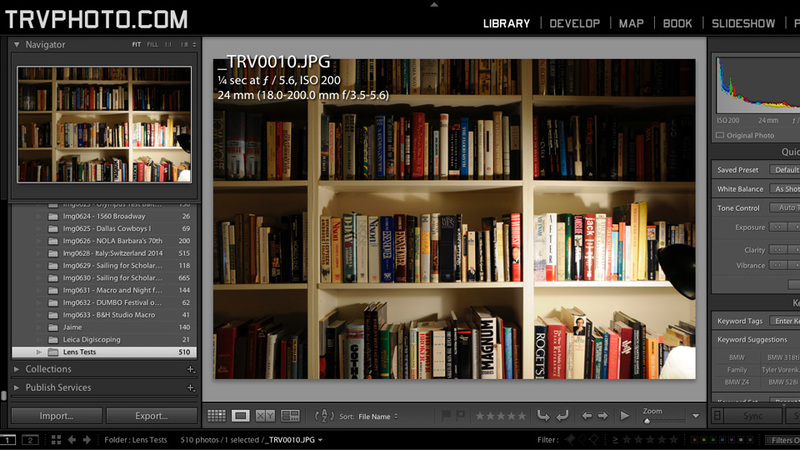 I start by re-naming the files with the focal length of the actual shot, and the aperture plus the name of the lens. Example: 105mm f8 - Nikkor 70-200 f2.8 AF.jpg. Then, when finished, I can easily compare the shots from a certain lens or a certain focal length by opening just those images on my screen. Still got your paper and pencil handy? Open a series of images (single lens or single focal length) and start comparing the visual sharpness of the center of the images and the corners. Take some notes. 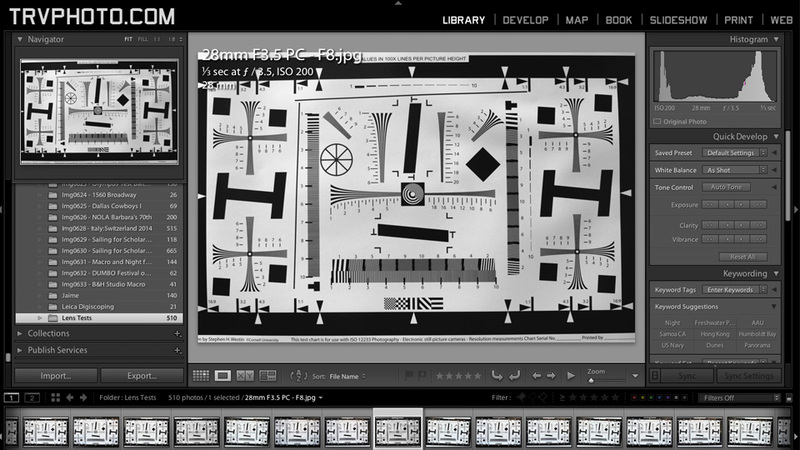 You can also evaluate the images for vignetting and symmetry, as well. For symmetry, verify that the lack of sharpness in the corners is the same for each side of the lens. For vignetting, you can push the contrast and levels sliders to see if the corners darken. When I compile my notes, I type them up and send the file to myself in an email, saving the notes on my smartphone. Now, when I am out shooting, I can quickly remind myself that my 50mm f/1.8 is slightly sharper in the corners at f/5.6 than at f/8 and that when I go below f/2.8 I start to lose sharpness noticeably. Mission accomplished. Let us know if you have different proven techniques or questions. Thanks for reading and good luck with your do-it-yourself lens tests! This is a fine article. I used it to test a Nikon 12-24 vs. a Ziess Distagon 18mm. I set the 12-24 at 18mm. I shot a rack of electronics at about 8ft in both Raw and JPEG. I am wondering, due to a comment in one of your responses: I shot all of the test at f8 on a tripod. I shot landscapes always on a tripod and at f8 and up. sorry the word shot should be shoot in two instances here. Thank you for the kind words about the article! I am glad you enjoyed it. You hit the nail on the head here in many ways. At f/8 (or maybe f/5.6) the differences between a super-expensive premium lens and a kit zoom will be really only visible to pixel peepers or seen in gigantic prints viewed at close range (because that is how everyone looks at big prints!). The Zeiss 18mm is likely sharper at wider apertures than the Nikon as prime lenses have that advantage over zooms. Also, you could see a difference in distortion and things like chromatic aberations as well, but sharpness at mid-apertures will always be close. Beware the argument that says, "Well, if you zoom in to 200% you can see the difference." That is not a real-life comparison as no one views prints (or even photos on the web) at high magnification. Let me know if you have follow-up questions and thanks for stopping by! Great article. I have a Nikon D610, I bought a used Nikon AF 28-105mm 3.5-4.5 D lens. The lens is great optically, but I noticed the focal length information is not accurately displayed, it always reads 75mm. I was wondering if the lens is defective or if this information is not sent from this lens to the camera. Your help would be appreciated. The short answer is, "I have no idea!" I would speculate that there is an issue with the electronic connections between the lens and camera. Sometimes you can clean them up a bit with a pencil eraser or by using other means, but usually the connections work or they don't. This seems like a specific failure. Of course, other information might not be being passed between lens and camera, but it is not "visible" to you. I would try to clean your contacts and then, if it bugs you a bunch, send it in for repair. If the lens is optically performing and the aperture and focus are all good, I would be tempted to ignore the metadata coming off the lens. If a lens will not focus properly at the infinity marking, does this mean the lens doesn't fit far enough into the camera body or just the opposite? Are you saying your lens will not reach infinity focus? Meaning, when focused at the infinity mark (or beyond), distant objects like stars and planets and mountain ranges are still blurry? Many lenses focus past the infinity mark, so be sure you haven't passed infinity and started to defocus on the backside of that "distance." If you cannot manually focus at all on very distant objects, regardless of the position of the focus ring, then there is an issue with the lens (most likely) and/or the camera mount (unlikely unless the camera was damaged) that will require testing and repair. Let me know what you discover or if you have amplifying information. That definitely doesn't sound like something you are going to be able to correct with contact lenses or split filters! Your options are sending it back to Nikon or sending it to your local camera repair store (depending on where you live, there might be one). There are a few repair places in New York City and you can certainly call them and ask if they have the capability of fixing that repair. Also, check your warranty paperwork from Nikon and give them a call to see if you are still covered. Good luck and let me know if you have more questions! Thanks for stopping by! Thanks. No major camera shop nearby. Probably will need to send to Nikon. Appreciate the help. You could contact repair centers in other towns to see if they work through the mail...depending on what Nikon says, you might want to investigate this to save some money. Hi Todd: Thanks for a very helpful article. I have a question: after taking all the shots and comparing, how large of the image usually to magnify to view in Lightroom for sharpness? 1:1 or 2:1 or 3:1. Thanks. First of all, thanks for the kind words! I am glad you enjoyed the article. Secondly, great question! There is no right or wrong here, but I just checked my LR and I go to 1:1. I believe that is "100%" and that would be similar in Photoshop. You can get closer, but my feeling is that, if you zoom in more, you'll only be racking up credits for a graduate degree in Pixel Peeping and that degree gets you into even less doors than an MFA! Todd, I am following your procedures to conduct an experiment. I am trying to confirm that an APC lens (borrowed Canon EF-S 15-85 f3.5-5.6 IS) would have higher image quality than a Full Frame lens (Canon EF 24-70 f4.0) on my crop sensor (Canon 7D) body. The plan is to shoot both lens over their similar focal lengths at the 24, 35, 50, and 70 for each f5.6, 8, and 11 appeture. The question that remains is the focus method. Do you rely on Auto focus? If so are the lens auto focus "fine tuned" using the custom function III-05: Fine tuning your Autofocus lens for each lens? Do you manually focus on the chart? Do you use "Live View" to achieve focus? Thank you for any guidance that you could provide. Sorry for the delay in replying...I was out of town last week. So, for auto focus lenses, I usually use the auto focus when doing the lens tests. If I get an un-sharp image at sweet spot apertures, then I would speculate that I had an AF error, or kicked the tripod. My recommendation would be to test both lenses with auto focus on. If you don't get good results, try a round with manual focus and, yes, I would recommend Live View to assist with accuracy there as the days of awesome split prism focus screens are mostly gone. My guess is that the 24-70 will be sharper around f/4...but at f/8, it will be harder to tell them apart regardless of the focal length. Let us know what you found! Thanks for stopping by and, again, sorry for the delay in replying. A whole shelf of books about Nixon ? What's up with that ? I'll have to ask my old man...it is his bookshelf! The target image is only 72dpi, if i would print this the quality in not very good. Is not possible upload a 300dpi version? The original file is the same dpi...so you have it at maximum resolution. It should be sufficient for testing. The well known ISO 12233 charts can be found online and they are at similar resolution in .pdf form. Sorry I am not more help, Mick! FYI, after I wrote this article I modified the ISO 12233 chart with my website and "company" logo...pretty fun to make your own test target! Thank you for very good and very useful article. Thanks for stopping by, Darek! Thanks for the great article Todd. I have an old Nikkor 50mm 1.8 AI S 400,000 series lens I use on my D200 camera.This 6 element lens seams to be sharper in the mid aperature ranges than my 7 element 50mm 1.4 lens that I bought with my Nikon F back in 1969. I'm going to use your lens testing technique to check check out both lens. Do you know anything about this 50mm 1.8 pancake style lens? That older 50mm f/1.8 AI S lens is one of my favorites! I have one on my Nikon FM3a all the time and have used it on my digital cameras as well. I owned most of the Nikon 50mm lenses before the G-series lenses arrived and I always found the 50mm f/1.8 lenses to be superior to the 50mm f/1.4 versions. Nikon didn't change the optics of the 50mm f/1.8 for several generations of lens barrels—a good thing! I am sure the new G versions are great, but that older pancake lens is really fun to use and a perfect size! The old 50mm f/2 is just as sharp in the mid apertures and you can find them at thrift stores for less than $20 these days! My 1960s vintage 50 f/2 is the sharpest lens I have used owned, including hassy 6cm x 6cm and Schnieder 4x5 glass. It was a great lens! I sold mine only because I didn't like the 6-pointed sun stars it produced. Thanks for writing in, Paul! I am looking for the Program to evaluate images, in Afterwards I can't find this info. 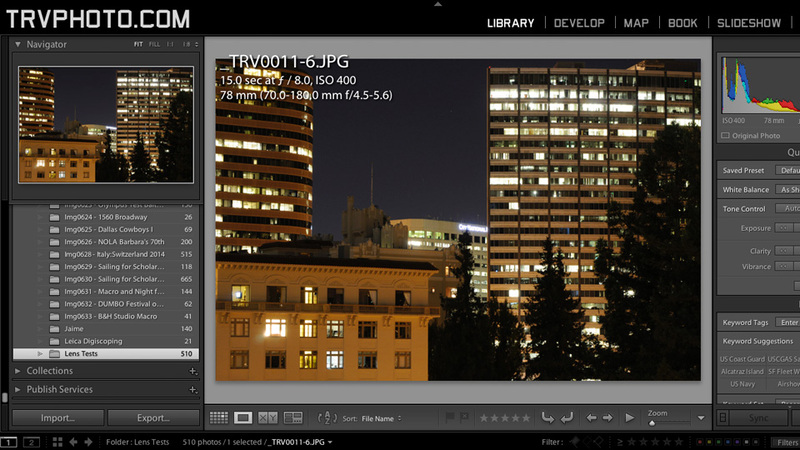 So how do you evaluate /view images? There are a lot of different software options for viewing test images, including the default software that comes with most systems. I personally use Lightroom or Photoshop, but those are powerful programs that aren't required for simply opening test shots and zooming into them to check image sharpness. 50mm is probably the only lens you 'll need . This probably applies if you have a camera full-frame , but still, if you have an APS-C, this lens will be an excellent investment. Both Canon and Nikon, the 50mm f / 1.8 lens is the cheapest they have for sale. Depending on the country, the price ranges between 100 and 120 dollars, so it is an excellent choice if you manage a budget. This lens will allow you to achieve images that kit lens can not perform. Having an opening of 1.8 lets you work with a depth of field very small and can explore portrait photography otherwise . I am a big fan of the 50mm f/1.8. Thanks for posting, yabesh! I like the signs on wall I like same image at varying light and f/stops.. I test bokah too. Thanks for reading and sharing your tips, Matthew! Yep, that is why I said, "as close to equidistant as possible." But, truth be told, I am not good at basic math. Thanks for the kind words! I am glad you enjoyed the article. My guess is that the chart will work just fine for your drone camera. Let us know if it works out for you! Good luck! I'm brokenhearted. I just received my new Canon 24-70 2.8 L-II lens based on rave reviews about its sharpness across the entire range. Wow, it IS sharp, the sharpest lens I've looked through. The dilemma is the awful vignetting at 50mm. The first-generation lens is MUCH softer but doesn't have anything CLOSE to the vignetting of its replacement. The lens is going back. Dang. There is nothing worse than a broken heart! Sorry to hear about your vignetting issues. Do you have a UV filter on the lens? Is the filter ring slim? Have you read about others with that lens having the same problem? I hope you just got a bad example and, if you get another one, that it works great for you! Keeping the lens. Adobe Camera Raw dispenses with the vignetting. Magic happens right in front of me. Service from B&H is stellar! That would actually be my dream lens! I LOVE vignetting and that lens would save me time in lightroom! Hope your repacement lens works well for you. 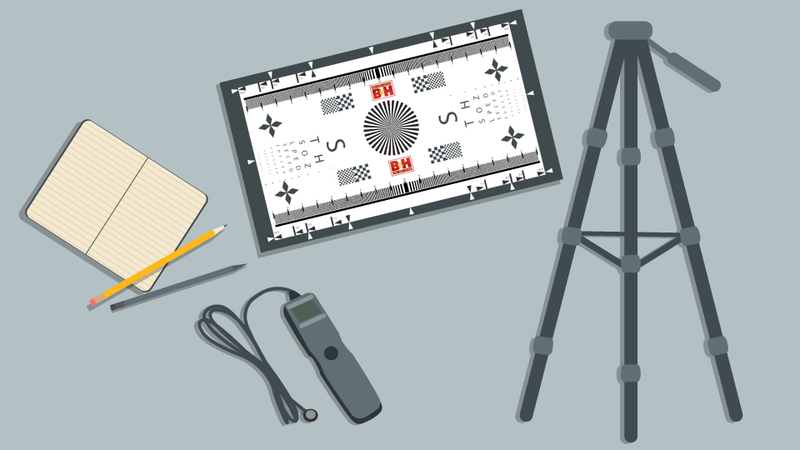 The rulers are generally used to find if the lens is front or rear focusing; Lie the paper on a flat surface camera set to angle above, about 25 degrees is good. Set focus to center point focus. Then focus ensuring that your auto focus hits the center of the page (with this chart I would aim right at the ruler). Take the photo and review. Repeat for valid sample group. If the auto focus is correct the sharpest part of the image will be 10 (on this chart) on the ruler. If you camera allows it you can then set micro focus adjustments until it's spot on. I have a Sigma 1.4, 50mm that was terrible until I did this - now my favourite lens! Luckily for me (knock on wood), I haven't experienced a focus issue with any of my lenses. Thanks for the article. I have a question on sharpness: can lenses lose it over time? If so, is there anything that can be done to fix them? I have a lens (Nikkor 18-105mm DX VR) that can't seem to take sharp photos anymore, even on a tripod with VR off. I did a lot of home testing on it--different f ranges, shutter speeds, zooms, pre/post cleaning, tripod/handheld, two different bodies (D40 & D5500), live view vs. viewfinder, manual vs. auto focus--and can't figure out if there's something wrong with the lens or if it's just me. I don't think it's a front/back focus issue (used Tim Jackson's focus test chart), but I'm not sure. Yes, lenses can become "less sharp" over time. This could be due to mechanicals wearing out, elements becoming misaligned slightly due to impacts, or perhaps due to fungus and haze in the optics. Are any of these the culprit for your lens? Only you can figure that out. Also, if you upgraded your camera to one with higher megapixels, you might just be seeing that lens flaws are more noticeable with increased resolution—certainly something to think about if chasing the golden ring of megapixels! But, the fact that you are seeing it on two different bodies might cancel that argument. You could send the lens to Nikon for a diagnosis if you can live without it for a while. I know this isn't an answer, more of a few hypotheses for you. I hope it was semi-helpful! To Jenny, re the Tamron 90mm, check that if it has VR, VR is off. If it is on that will produce the effect you are seeing. Thanks for helping Jenny, Steve! Initially, she did have VR on, but still had issues after it was turned off. We are still troubleshooting. Great article. I noticed the chart has some sort of "rulers" at top and bottom; can I find the lens resolution power by those? and how? It would be awesome too if the letters on left and right (with the small numbers) are explained. I think this chart has more to extract from other than simple CA and vignetting check. We based our chart on one that we found on the web. The online chart did not explain the markings, so your guess is as good as mine! Sorry I can't be more assistance. If you want to do some homework, feel free to find the other chart and see if you can contact the designer. I would be interested if you find any information out. Maybe I will go digging, too! I emailed the creator of the ISO 12233 chart that I found on the web, but no reply yet. I'll let you know! Let me know when you get the test results from your fisheye lenses! I wrote a long blog post - which I hope it would be useful. I had some setbacks but well, I hope the results can be relied on. Thanks, TJ! Looks like a comprehensive test. I hope the chart is working well for you. No worries! Good luck, TJ!